Now, with the help of Liam and Hamish, an eight-foot sentient insectoid also training at the clinic, Zenn must learn what’s happened to her father, solve the mystery of who, if anyone, is sabotaging the cloister, and determine if she’s actually sensing the consciousness of her alien patients… or just losing her mind. All without failing her novice year…. 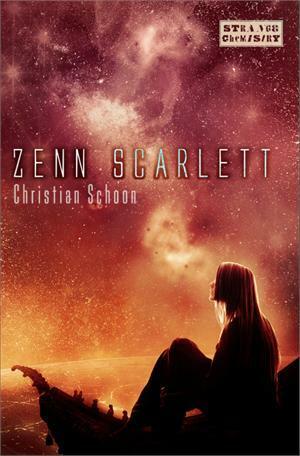 My heroine Zenn Scarlett is a 17-year-old girl with few social… issues. For a variety of reasons – some understood by Zenn, some not so much – at this point in her life, she finds herself in need of protection. Physical protection, emotional protection. So, almost all of us have walls of one kind or another. And anyone who’s read more than a few young adult books will have come across this metaphor. Kind of goes with the territory for certain kinds of stories. Like dragons go with castles. Probably archetypal. Zenn’s layers of protection take a variety of forms, due the variety of “dragons” that have prompted her to believe she’s better off with some sort of curtain-wall/motte-and-bailey set up. Zenn’s mother Mai was lost to her at an early age during a risky medical procedure on a colossal alien animal called an indra. This prompted Zenn’s heart-shattered father Warra to leave on an apparently Quixotic quest to unravel the mystery of his wife’s untimely death. Then there’s Zenn’s environment. She literally lives walled-off from the world, in a cloister. It’s a formerly religious compound that, over time, has transferred its allegiance to the wonders of science. But even though we’re far in the future, this place is still medieval in certain concrete, or mud-brick, ways. The thick walls of the Ciscan Cloister Exovet Clinic and Training Facility separate the cloister and its menagerie of exotic alien animals from the nearby town of Arsia City. The towners have a strong dislike for the Ciscans and their “disease carrying” alien patients. So, Zenn came of age behind real walls, thinking of herself as fundamentally separate from others, feeling besieged, in a way, by the attitudes of people unwilling or unable to understand her cloistered world. Raised on her own in the cloister, Zenn hasn’t had any friends other than her uncle Otha, Sister Hild, Hamish – a sentient, eight-foot beetle – and the many animals she sees every day. Now, enter Liam Tucker, a towner boy Zenn’s age, who lately has been acting as a sort of go-between, facilitating the bartering of goods between town and cloister. Did I mention the story is set on a colonized Mars cut off from contact with Earth and balanced on the precipice of starvation and collapse? Should probably mention that. Liam is easy-going, street-smart, a bit of a trouble-magnet and increasingly interested in Zenn. This attention is less than welcome. Zenn, studying to be an exovet like her mother, is in the midst of her all-important end of term tests. She doesn’t have time for distractions. Besides which, Liam is a towner, and towners are to be avoided when possible, grudgingly tolerated otherwise. Before long, though, Liam shows himself to be, at least potentially, different from the towners Zenn is used to. Due to all the above, Zenn isn’t the sort to simply fall into a friendship, let alone wander into the shadowy terra incognita of anything beyond friendship. She’s logical, raised in a house of science, a place where symptom X is treated with medicine Y with probability Z of yielding result XYZ. Friendship is a sufficiently novel concept to her that she will give the prospect some serious pro/con analysis. And the calculus she uses is, not surprisingly, powerfully informed by past experience. She’s a two-time loser in the parental game. She’s grown up in a them-against-us world. She’s at a critical phase in her education where anything remotely likely to lead to failure is simply is not an option. The equation seems straightforward. But there’s a problem with castle walls. They’re built by gravity-bound humans. And… whoa!… dragons have wings. Thank you so much Christian for writing this post and joining us at ChooseYA. Zenn Scarlett is released May 2nd here in the UK and May 7th in the US/Canada and is published by Strange Chemistry. The rest of the blog tour dates and hosts can be found here.